Everyone who writes about time travel designs their rules and mechanics to suit themselves. 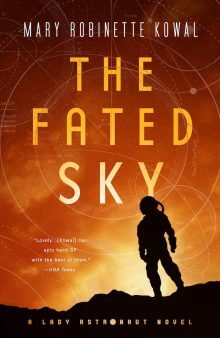 Connie Willis’ academic time travelers embed themselves in the past, and Kage Baker’s Company time travelers operate like cold war spies. We all apply time travel with restrictions that serve the stories we want to tell, highlighting the aspects of time travel that most intrigue us. I’m not particularly interested in paradoxes or altering the future by changing the past. My time travel is designed to be consequence-free. This is because what I like best about time travel — my favorite bit — is the ability to see how people really lived. Like my characters Minh, Hamid, and Kiki, I would do anything to visit the past. But it wouldn’t be enough to just be able to visit just a few places. When I dream about time travelling, I want to be able to see it all. I want to see the past using the Google Earth of the future. And because I have no romantic ideas about danger being fun, I want to do it in perfect safety. When Minh, Hamid, and Kiki land on a remote South Pacific island in 2024 BCE with Fabian, a professional historian, the first thing they do is launch satellites. Not only does this provide them with ambient power to run their tech, the satellites form a globe-spanning, high resolution remote sensing array that allows them to spy on people from a God’s eye view. This is practical. Humans are dangerous, and they want to ensure that no past population members paddle up to the beach while they’re not looking. But the remote sensing is also part of their work. Minh, Hamid, and Kiki are ecological scientists running a past state assessment on the Mesopotamian trench. They’re spying for science. Within a few hours of landing in the past, my time travelers can run population analyses, identify human settlements, and pinpoint agrarian and hunter-gatherer communities. For specific, pre-identified points of interest, the data from multiple satellites are combined to provide a tilt-shifted view of a ceremony atop the massive ziggurat of Ur, with an angle that allows them to see the faces of the participants. They gather data for climate analyses and scan the topography using LIDAR to build ecosystem models. This is absolutely my favorite bit. The instant Minh hits the ground, she starts launching satellites. She’s got a project to run, and she’s fiercely competitive. She wants to show Fabian she’s in charge. She can’t start her work until the satellites are up and running, so she’s not going to waste any time. Before long, the satellites begin providing a global view, lighting up the continents with data. The whole world is at their fingertips, in a high resolution heads-up display, like Google Earth on steroids. Now, if it were me, I’d stay on that nice, safe South Pacific island and revel in my god-like spy power. I’m a Google Street View junkie, and I can’t imagine anything better than a Street View of the remote past. But Minh, Hamid, and Kiki didn’t travel 4000 years in the past to sit around in safety. They take the first opportunity to get themselves into trouble. 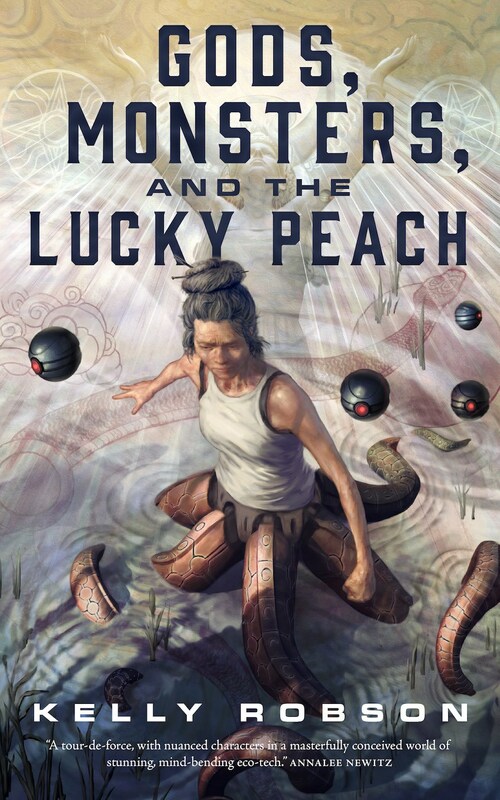 Kelly Robson’s Gods, Monsters and the Lucky Peach is newly out from Tor.com Publishing. 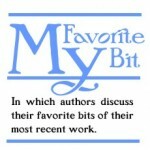 Her short fiction has appeared in Clarkesworld, Tor.com, Asimov’s Science Fiction, and multiple anthologies. In 2017, she was a finalist for the John W. Campbell Award for Best New Writer. Her novella “Waters of Versailles” won the 2016 Aurora Award and was a finalist for both the Nebula and World Fantasy Awards. She has also been a finalist for the Sturgeon and Sunburst awards, and her stories have been included in numerous year’s best anthologies. She is a regular contributor to the Another Word column at Clarkesworld. Kelly grew up in the foothills of the Canadian Rocky Mountains and competed in rodeos as a teenager. From 2008 to 2012, she was the wine columnist for Chatelaine, Canada’s largest women’s magazine. After many years in Vancouver, she and her wife, fellow SF writer A.M. Dellamonica, now live in Toronto.